While the global warming scare got rolling, other climatic events such as receding glaciers have also garnered much alarmist attention. 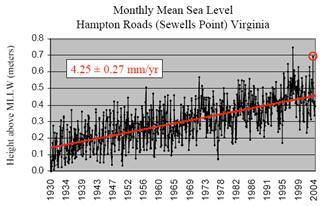 Sea level increase is the focus of this document. See also: www.appinsys.com/GlobalWarming/SeaLevelRising.htm for debunking of some wild sea level claims made by politicians. A major concern about global warming is the potential rise in sea level. This could result from the melting of the Greenland and/or the Antarctic ice sheets. Greenland has been exhibiting recent melting whereas Antarctica has not (see previous subsections on these). The IPCC stated in the Third Assessment Report (2001) [http://www.grida.no/climate/ipcc_tar/wg1/425.htm]: “There is no evidence for any acceleration of sea level rise in data from the 20th century data … Mediterranean records show decelerations, and even decreases in sea level in the latter part of the 20th century”. states: “The sum of steric sea level rise and the ocean mass component has a trend of 1.1 ± 0.8 mm/a over the period when the Paulson GIA mass correction is applied, well overlapping total sea level rise observed by Jason-1 and Jason-2 (1.3 ± 0.9 mm/a) within a 95% confidence interval.” These rates are less than the 20th century sea level rise rates. Although Al Gore and other alarmists make statements about scary unrealistic increases in sea level, the IPCC AR4 (2007) report predicts that sea level rise will be 0.6 – 1.9 feet by the year 2100. The larger value is reduced from the IPCC TAR (2001) report which predicted 0.3 to 2.9 feet by 2100. The historic rate of 1.6 mm/yr over the last 100 years translates into a sea level rise of about 6 inches by the year 2100. Alarmists say everything is accelerating and it’s worse than expected. But they carefully select start and end dates to create exaggeration. 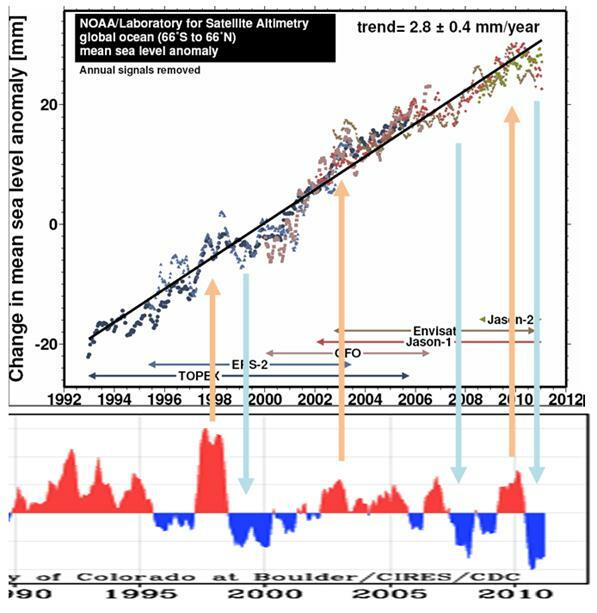 The following figure shows sea level from 1993 through 2009 [http://sealevel.colorado.edu/]. This figure shows a rate of 3.1 mm/year since it starts at a low point in the fluctuating data (the 1993 start indicated by the arrow in the above figure). There is a major difference between the above two versions of the same data through 2005 – the older data has more recently been adjusted downwards to increase the apparent rise. The following figure shows the data through 2009 changed to magenta and superimposed on the data published through 2005. 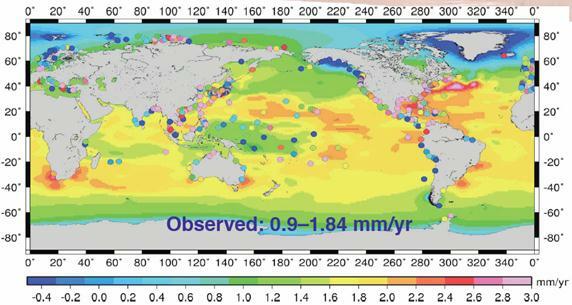 Sea level change varies constantly all over the Earth. Sea level gauges have been used the longest (although in very few locations) but require adjustment due to the fact that the earth is also changing its height in various places. For the northern part of the northern hemisphere, the earth is still rebounding from the weight of the ice in the last ice age (glacial isostatic rebound). This causes the appearance of falling sea levels in those locations (see the sea level figures in the Alaska Regional Summary, Western North America Regional Summary and Baltic Sea Area Regional Summary for examples of isostatic rebound sea level changes). 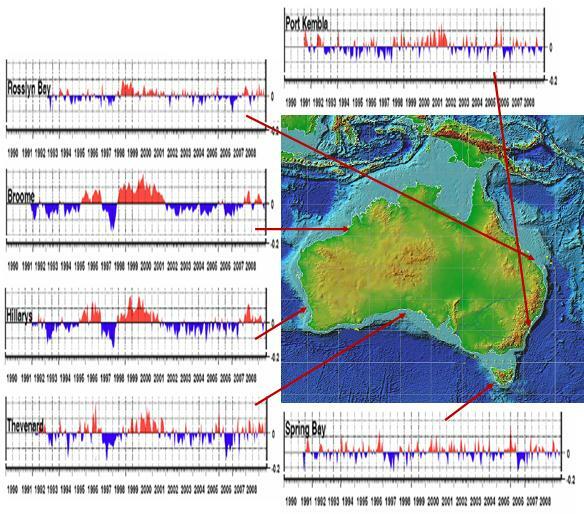 Since the use of satellites to measure Earth phenomena has developed, several satellites are used to measure sea level on a global basis. 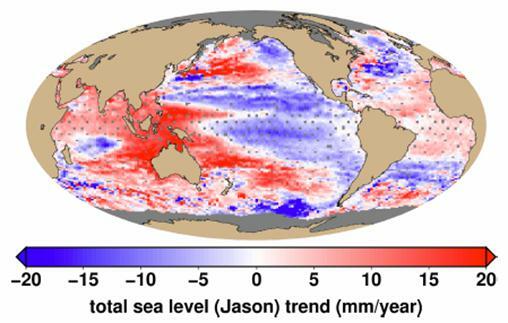 The following figure shows the a recent sea level figure from the NASA Jason satellite [http://sealevel.jpl.nasa.gov/science/jason1-quick-look/]. 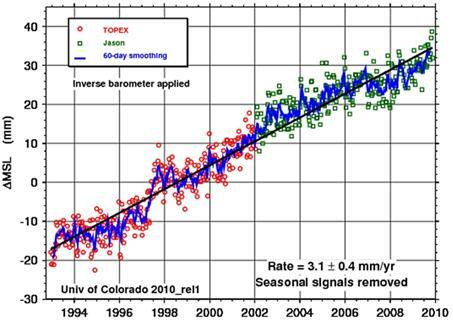 Unfortunately, satellite measurements for sea level began just over a decade ago. 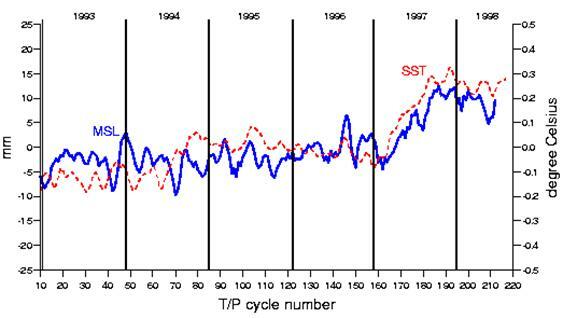 The following figure shows global sea level change rate from 1900 to 2003 based on 525 tide gauges (indicated as dots) and satellite altimetry. 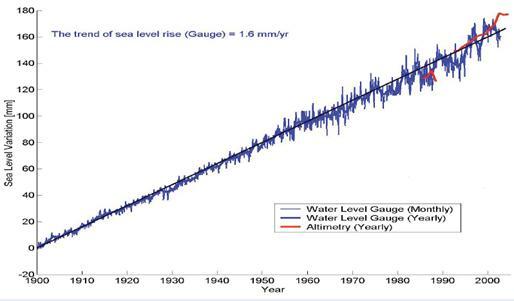 [http://www.wamis.org/agm/meetings/rsama08/S304-Shum_Global_Sea_Level_Rise.pdf]. The isostatic rebound is noticeable in the Arctic. The Oceania islands north of Australia (including the global warming poster-child Tuvalu) have less sea level rise than most of the tropics, with some stations showing sea level declines. The Gulf Stream is noticeable in its higher rate of sea level increase, likely due to the Gulf Stream getting warmer (this is also noticeable in the Jason figure above). 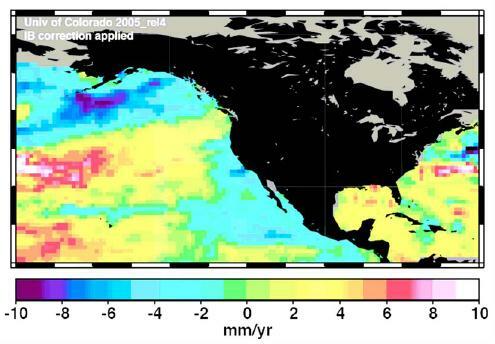 The following figure shows the effects of isostatic rebound on sea levels along the western (Pacific) coast of North America. The Fisheries and Oceans Canada maintains data on sea levels at Canadian ports. [http://www.meds-sdmm.dfo-mpo.gc.ca/meds/Databases/TWL/Products/Monthly_Means_b.htm]. The following figure shows the annual sea level anomalies (in meters) for two east coast and two west coast ports for the last decade. In all cases the average sea level for the last decade is down by about 1 centimeter from the long-term average sea level. However, a decade does not provide much information on trends. The following figure shows sea level history at Funafuti, Tuvalu (an island that according to Al Gore is rapidly disappearing due to sea level rise). The Australian government installed a sea level gauge at Funafuti in 1993. Tuvalu update 2009: The following figure shows sea level data at Funafuti, Tuvalu to June 2009 (From Fig 11 in [http://www-cluster.bom.gov.au/ntc/IDO60102/IDO60102.2009_1.pdf]) The figure speaks for itself. The El Nino / Southern Oscillation is calculated based on sea level pressure differences across the pacificThe following figures show the effects on seal level in Ecuador. 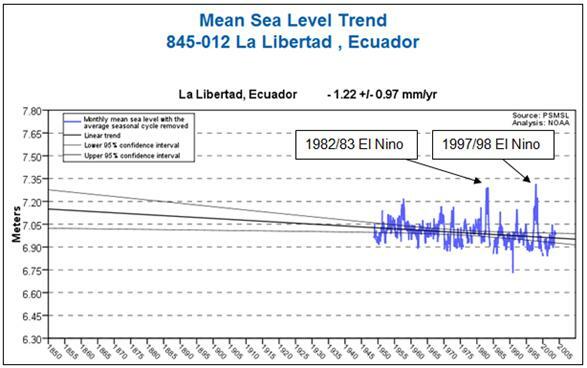 The following figure superimposes the sea level data for La Libertad from the figure above (changed to green) on the multivariate ENSO Index plot shown previously. 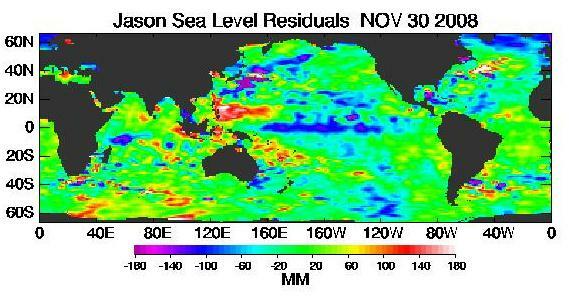 This shows a strong correlation between the ENSO and sea level variation. See http://www.appinsys.com/GlobalWarming/ENSO.htm for more details. The current “pace of change” is 2.8 +/- 0.4 mm / year. By 2100 the additional rise is 10 inches. It seems that Holdren has a problem with arithmetic (or a problem with telling the truth). 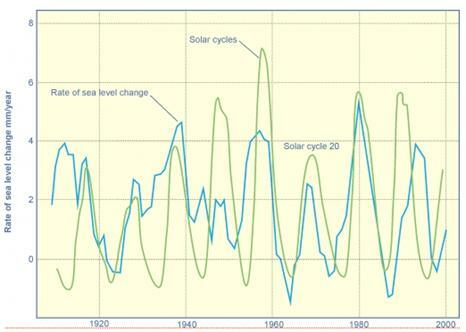 The following figure compares the rate of sea level change with the solar cycles [http://wattsupwiththat.com/2009/02/23/ice-ages-and-sea-level/#more-5804]. The blue line in the figure below is the same as the dark blue line in the figure above. The following figure shows sea level change for the North Sea over the last 8000 years. [http://www.up.ethz.ch/publications/documents/Wanner_H._et_al._08] It is clear that the recent rate of sea level change is no different from the rate over the last 2000 years. 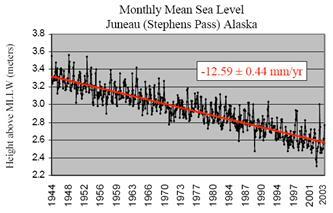 The Alaska summary [www.appinsys.com/GlobalWarming/RS_Alaska.htm] shows graphs of historical sea level for the available several locations in Alaska – all of which show declining sea levels due to isostatic rebound. The Western North America summary [www.appinsys.com/GlobalWarming/RS_WesternNorthAmerica.htm] shows historical sea level trends for the North American Pacific coast. The Baltic Sea summary [www.appinsys.com/GlobalWarming/RS_Baltic.htm] shows historical sea level trends for the Baltic Sea. The Africa summary [www.appinsys.com/GlobalWarming/ReutersAfrica.htm] shows historical sea level trends for Africa. The India summary [www.appinsys.com/GlobalWarming/RS_India.htm] shows historical sea level trends for India. 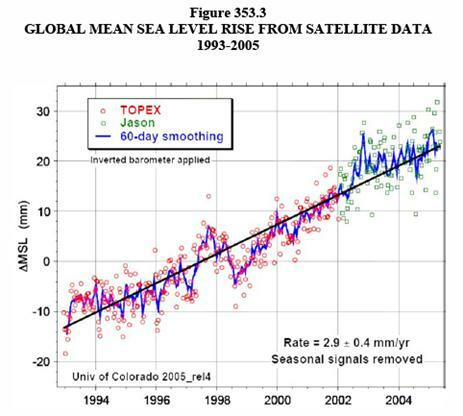 See also: www.appinsys.com/GlobalWarming/SeaLevelRising.htm for a 2009 update on Tuvalu as well exposing other sea level exaggerations.